John Wellington Gwynne was born in Castleknock, Ireland, on March 30, 1814. He was the son of William Gwynne and Eliza Nelson. After studying at Trinity College in Dublin, he emigrated to Canada in 1832, at the age of 18. He enrolled as a law student with the Law Society of Upper Canada then spent two years articling with Thomas Kirkpatrick in Kingston, Upper Canada (Ontario). In 1834 he moved to Toronto where he completed his articles in the law office of Hagerman & Draper and practised law after being called to the bar in 1837. His interests extended beyond law; from 1845 to 1853, he was a railway promoter, founding the Toronto and Guelph Railway Company, which eventually amalgamated with the Grand Trunk Railway Company of Canada. In 1868 he was appointed to the Court of Common Pleas. Three years later, he chaired a commission of inquiry into the fusion of common law and equity, a controversial topic at the time. He was appointed to the Ontario Court of Error and Appeal in 1874 and to the Supreme Court of Canada on January 14, 1879. He served on the Supreme Court for 22 years. 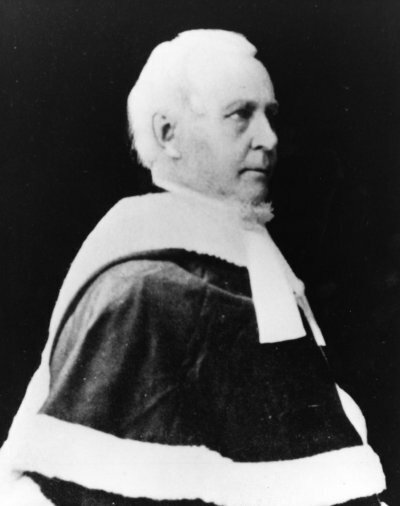 Justice Gwynne died on January 7, 1902, at the age of 87.